The next interview in my spotlight series on the current Aurora Award ebook bundle is with Stephanie Bedwell-Grime on her paranormal romance, Fallen Angel. Stephanie is the author of more than thirty novels and novellas, as well as numerous shorter works. 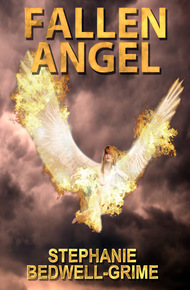 She is a five-time finalist for the Aurora and has also been an EPIC eBook Award finalist. What’s your strongest memory of writing this book? My most vivid memory of writing Fallen Angel is working on Chapter Thirteen. I was writing about the apocalypse. I was really immersed in the story when the radio station I was listening to made this weird click sound and the signal died. A second later the power to my computer went out. What’s your favourite relationship between two characters in this book and why? My favourite relationship is the one between the main character, Porsche Winter and Cupid. Cupid is the kind of best friend everyone needs. He’s always got Porsche’s back, even when she’s in heaven, hell, or jail. The one thing they don’t agree on is Porsche’s relationship with her former charge, Alex Chalmers, which causes a lot of friction between them. What’s your favourite scene in this book and why? My favourite scene has got to be the one where Porsche barges into Cupid’s apartment in heaven. Porsche describes Cupid’s lair as a “pink, fake-fur nightmare”. I had so much fun coming up with things that Cupid might have in his home, like his fuchsia shag carpet vying for attention against a red velvet couch and white pillows. But Porsche’s visit comes at a bad moment and Cupid is furious. Suffice to say the visit does not go well. Thanks, Steph! Folks, time is running out on this bundle. Only five more days before it's gone. So check it out here for your chance to own some of the best of Canadian speculative fiction at a bargain price.